We are a full service distributor of premium gourmet fruit smoothies, margarita mix, frozen cappuccino mix and other frozen drink mixes. 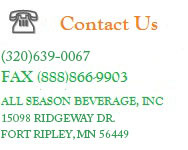 We sell VitaMix blenders like the VitaPrep and Bar Boss, all Vita-Mix commercial blenders. We also sell margarita machines made by Bunn, Cecilware, and Faby. We offer a complete selection of our own Tropical Impressions brand smoothies as well as gas powered blenders, Patio heaters by Endless Summer and Uniflame, and Portable ice maker, like the new Windchaser IceMan. The powerful BarBoss comes with a stop timer and optional 64oz jar. Very simple to program and run with touchpad display. Quickens freeze time and reduces air mixing with product. Copyright 2005-2015 © Tropical Impressions All rights reserved.